As you know, Co Q 10 is a fat-soluble vitamin-like substance found naturally in all forms of animal life. It is biosynthesized in the membranes of cells in humans and is vital in the production of energy. It is found in most cells, with especially high concentration in the heart (the organ that requires high levels of energy for normal operation). If that wasn't enough, it’s an antioxidant as well. Co Q10 in your body needs to convert it to Ubiquinol, but as we age, we are less efficient at converting it. 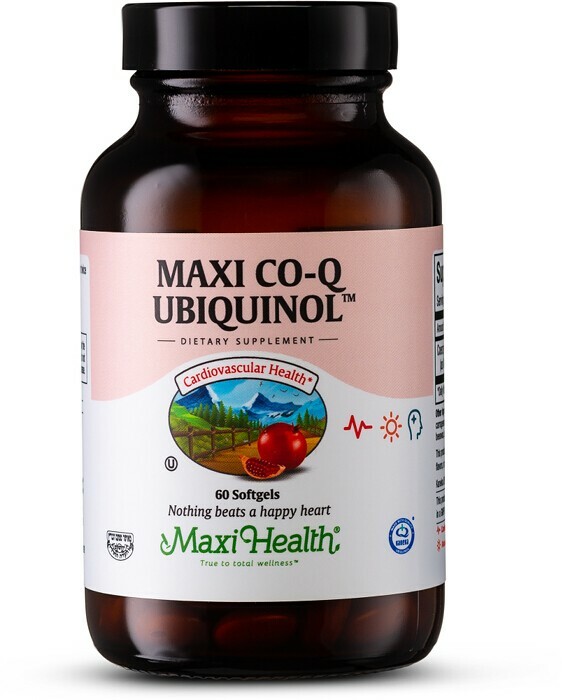 For the first time, a kosher stabilized Ubiquinol is now available with Maxi CO-Q Ubiquinol™, providing 100 mg of high-absorption CoQ10 in a single liquid kosher capsule. Try Maxi CO Q Ubiquinol™! Other Ingredients: Medium chain triglycerides, Gel Shell (cornstarch, carrageenan, glycerin, purified water, Tomat-O-Red® Lycopene color), beeswax, sunflower seed lecithin. This product contains no animal products, soy, wheat, gluten, yeast, milk, artificial flavors, coloring's or preservatives.